Brittland Manor is one of our favorite venues in Maryland. Not only does it have beautiful waterfront views of the Chester River, the remote location and lodging options make weddings feel like a mini retreat with your closest friends and family. Joe and Cara went out of their way to welcome friends and family from all over the country to Chestertown for a beautiful weekend together on the Eastern Shore. A gorgeous flowy Christos gown from Garnish Boutique, stripped linen napkins, rustic farm tables, lawn games and root beer floats all came together to create the perfect mix of elegant yet relaxed details. We absolutely loved being a part of Joe and Cara’s wedding and we’re so excited to share it with you today! 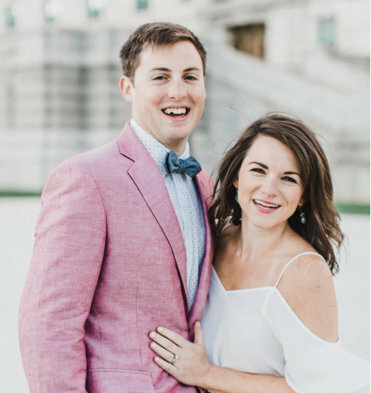 Cara and Joe met in DC after college through friends as part of a running group. Lizzie, Cara’s best friend and maid of honor, really facilitated the introduction of the two. They hit it off, having very similar personalities and senses of humor, even though Joe had five siblings and Cara was an only child, they both had similar upbringings. They were both wary of getting into something serious as Cara was leaving to live in Africa for a year for work, but once she left they quickly realized things were more serious than a summer fling. Since then they’ve been together for more than six years, living in DC, Baltimore–where they got engaged–and then moving across the country to Seattle while they planned their wedding. They both knew having a church ceremony and an outdoor celebration were important to them, so they had a small ceremony at the church that Joe grew up in the week leading up to their wedding, then Cara’s aunt, a judge, married them at Brittland Manor. Brittland Manor was the perfect venue, having a big outdoor space, feeling like you’re in nature in the country, and having the water backdrop, but most importantly it was a place where everyone could hang out for the whole weekend. Cara’s parents live 15 minutes from the venue, and the Eastern Shore was a good mix of being between Philly, where Joe’s family is, DC, where they met, and Baltimore where they got engaged. The weather was perfect all weekend to spend time outside with friends and family–hanging out by the pool, explore the grounds, and playing games. 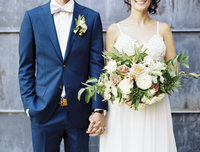 Cara’s main priority for the wedding was to keep things simple and comfortable, not too formal, but they knew they wanted to prioritize great food, hand-picked beer and wine, and music and dancing that would go all night.